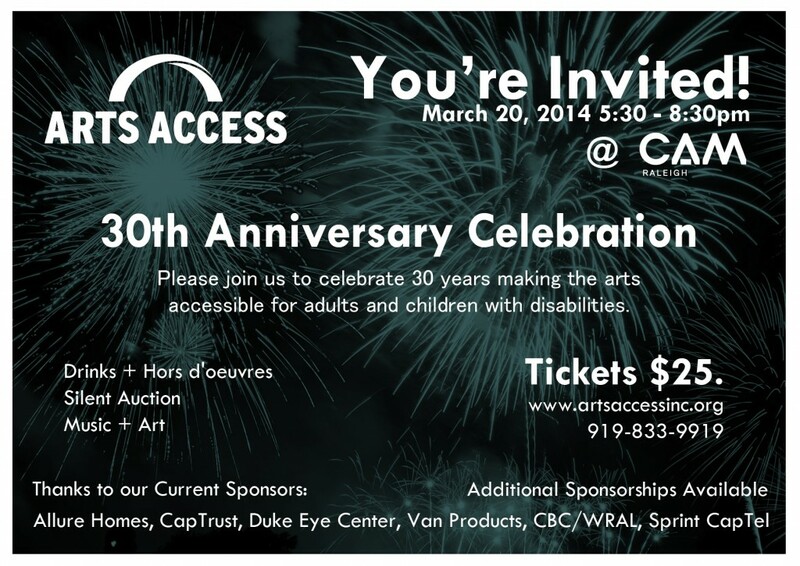 Arts Access is celebrating 3 decades of service to both North Carolina's arts and disabilities communities. Our 30th Anniversary Celebration is being held at CAM Raleigh on March 20th, 5:30-8:30pm. You are all invited to join us to celebrate what we have done and raise a glass to what we are going to do next! We'll have delicious food and drink, entertainment featuring the Triangle Alliance Chorus, the Canady Thomas band, and a silent auction centered on Raleigh's cultural arts community. Tickets are $25. Reserve your tickets through our Eventbrite.